So Full Of Flavor, My Family Always Begs Me To Make This Beef Stew! 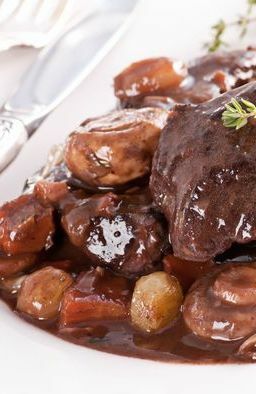 For a beef stew that’s absolutely packed with flavor, look no further than beef bourguignon. It’s a wonderfully savory dish with red wine, slow cooked beef, onions, and of course mushrooms. It’s the perfect dish to enjoy on a cold, winter day. Warm up a skillet, then add the bacon. Cook until the fat has rendered and the bacon is nice and crispy. Remove the pan from the heat, and transfer the bacon to a plate lined with paper towels. Pour off all but a tablespoon of bacon fat from the pan, reserving the rest of the grease for cooking. Return the pan to medium-high heat. Pat the beef dry and sprinkle with flour, salt, and pepper. Just before the bacon fat is smoking, add a single layer of beef cubes. Sear the meat in batches, flipping the pieces after 1 to 3 minutes. After each batch, transfer the seared beef to the slow cooker. Deglaze the pan with 1/4 cup of wine, using a spatula or wooden spoon to scrape off any browned bits from the bottom of the pan while the wine simmers. Pour the wine over the seared meat once the pan is cleaned. Add 1 more tablespoon of leftover bacon grease to the pan and repeat the searing of the meat and deglazing of the pan until all the meat is seared. Add one more tablespoon of the bacon grease to the pan and cook the yellow onions with 1/4 teaspoon of salt until soft and browned (6 to 8 minutes). Add the carrots and cook until softened. Add the garlic and tomato paste and cook until fragrant. Transfer the vegetable mixture to the slow cooker. Wipe the pan clean and warm one more tablespoon of bacon grease (or vegetable oil) over medium heat. Cook the mushrooms with 1/4 teaspoon salt until they release all their liquid and the liquid has evaporated. The mushrooms should end up a nice golden brown (about 8 to 10 minutes). Transfer the mushrooms to a clean bowl and set aside. Stir together the mixture in the slow cooker with an additional 1 teaspoon salt, the thyme, and the crumbled bay leaf. Add the herb bouquet to the mixture and pour in the beef broth and remaining wine over the mixture. Cover the slow cooker and cook on low for 6 to 8 hours. Just before serving, stir in the reserved bacon, pearl onions, and mushrooms, then cover and cook for another 10 minutes. Remove the herb bouquet the serve.